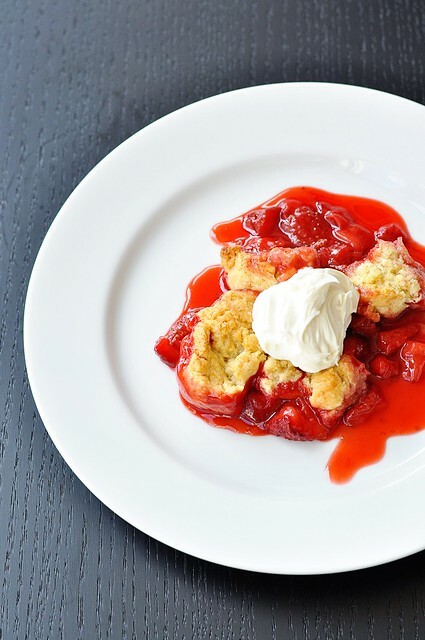 What do strawberry shortcake and cobbler have in common? Yes they’re both delicious, but think harder…. I did something kinda cheeky today. 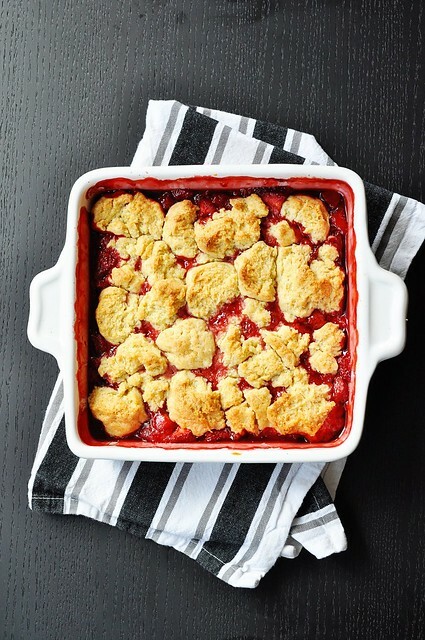 I made a strawberry cobbler using my sweet cream shortcake biscuits. Then I topped it off with whipped cream (okay, mascarpone). Then I ate it and nearly died. And now I’m sharing it with you. And I’m calling it Strawberry Shortcobbler. Feel free to groan, but I’m telling you—this is really good. Like, maybe the best thing I’ve made this year good. Expletives in between bites good. 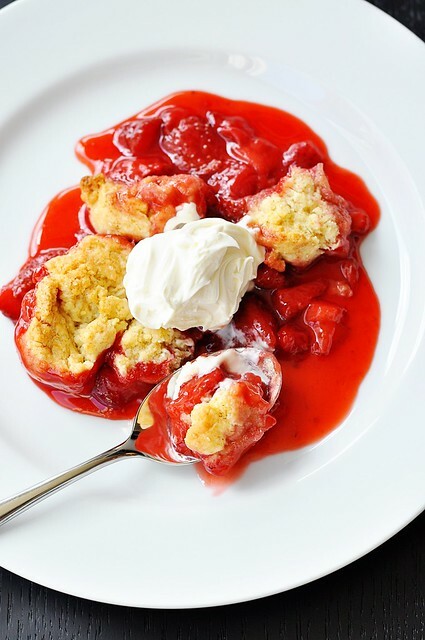 This will definitely be our dessert of choice for the holiday weekend, and probably for as long as I can still scrounge up strawberries at the market. I was determined to make strawberry jam this year, but I don’t know if I’ll be able to resist tucking every one I get my mitts on underneath a pile of biscuit dough and baking them bubbly. Not that that’s such a terrible thing. The biscuit recipe written below is halved from the original here, which is why the volumetric measurements aren’t so tidy. To make things a bit more even, you could double the cobbler recipe and bake it a little longer in a 9x13x2” pan. In a medium bowl whisk together the millet flour, potato starch, sorghum and tapioca flours, the xanthan gum, baking powder, sugar, and salt. Using a pastry cutter or a pair of knives, cut the cold butter into the flour until it is about the size of peas. Stir in the cream. Dust a work surface with potato starch and turn out the dough. Knead gently, 2 to 3 times, just until the dough comes together. Form into a disc and cover with plastic wrap. Place in the refrigerator to keep cold while prepping the berries. In a small bowl, whisk together the sugar and starch. Place the strawberries in a medium bowl and sprinkle the sugar mixture over them. Toss to coat thoroughly. Pour the berries into an 8 or 9-inch square baking dish. Remove the biscuit dough from the refrigerator. Tear off chunks of dough and drop over the top of the berries. There will be some gaps between the pieces of dough, just cover as evenly as you can. For a neater, more uniform cobbler, you could also roll out the dough, cut out biscuits, and place them on top. Brush the melted butter over the top of the biscuit dough and sprinkle with raw sugar. Bake the cobbler for about 40 minutes, until the biscuits are firm and golden and the fruit is thick and bubbly. 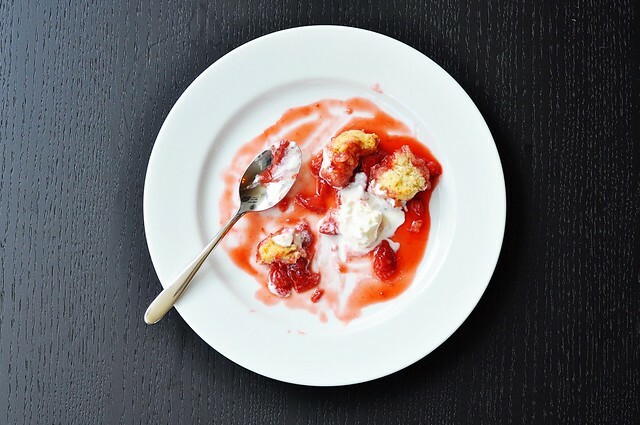 Serve with mascarpone or unsweetened whipped cream. Our local strawberry crop got flooded out but I’m going to try this with blueberres. It looks absolutely amazing. I love that your recipes are printable now.